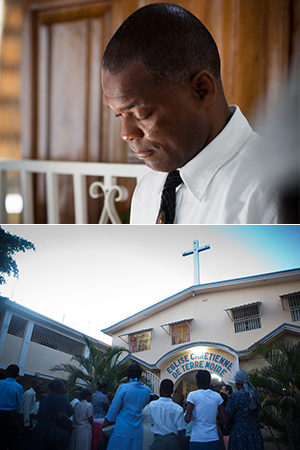 FHM has provided financial support to two former deacons from the Cite Soleil Christian Community Church, Jean Raymond and Aly Honore, to enable them to provide ministry and outreach to the people of Port-au-Prince.Today, Raymond and Aly are both leaders at the Repatriate Church. Pastor Leon Dorleans has mentored both Raymond and Aly over the years. Leon says, “In 1987, Aly is asked me to come and lead a Bible study for them in Cite Soleil. He’s been serving the ministry since that time. He is a very gifted leader. Whenever we want to start a new church, he has been the one we chose to take over, because of that gift, he started the Blanchard church as well as Repatriate Church. He has a very large family with 7 children and 3 granchildren. He is a tailor by trade. He is the best worship leader we have in all of the four churches. From time to time, I would send Aly to take special course to enable him to be a better leader.